First things first, we are happy to announce that the new followup design has arrived! The first thing you may notice (other than it’s on an iPhone) is how how much is NOT there. This was our #1 point of feedback and our primary one goal – to get the reminder out of the way so you can focus on your email. On larger displays, it reduces its vertical height by expanding horizontally to take advantage of the extra width – again, so you can have more space for your email. The ‘settings’ and ‘pending’ links in the upper right has been replaced by a subtle ‘help’ button. and a little footer that says that it was sent by FollowUpThen. We’ve tried to make the followup look as personal as possible while complying with spam-filtering rules. Read more about the minimal template. While a lot has been taken away, we did make one key addition, but only when your followup was scheduled via ‘cc’ or ‘bcc’ – a followup shortcut. reminders, you will see a blue “followup” button. 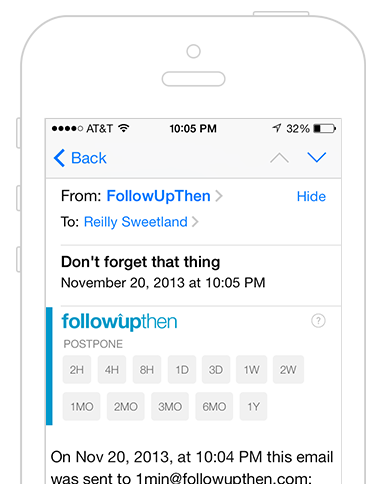 This button lets you re-send the original email with a followup message in a snap. The email that your recipient receives uses the minimal-style template shown above and appears as a personal followup message from you with the original thread below. Read more about email actions and the followup functionality. a new email message (pre-populated with some magic of course). On a phone or tablet, composing a new email is so fast that it makes the followup feel similar to a native app. Postponing and following up (shown above) make use of this new action feature, but that is just the beginning. them. We will eventually be enabling this by default on all accounts. Read more about email actions. Note: Our delayed email feature has since been discontinued. We are happy say that one of our most popular requests has now been completed and is available on FollowUpThen Premium: Sending an email to someone that arrives at a later date. line of the email. That way you can send a delayed email from anywhere: desktop, tablet or phone. There is one other premium feature has received a revamp: the calendar feed, which now has speedy email-based action links. Clicking into an event, then canceling now takes only a couple of seconds, and you can do it right from your native calendar app. …in fact, I am certain that is the case because we just added a new feature that you can only find in the tour! Start the tour now to see find your hidden new feature – free for all users, premium and paid. This latest release had a lot of new features, but what we’re most excited about is the foundation this puts in place, so keep an eye out for some more exciting and useful features in the coming weeks and months. Thanks to everyone who gave their comments and feedback on these designs. As always, suggestions and input from our users play a role in helping us make FollowUpThen better. Hopefully you’ll inbox will feel a bit lighter now that there are fewer pixels in there.